It’s a show I haven’t really sat down and gotten to know very well. I’ve only caught it in passing, usually when I was focused on something else. Sometimes I do that. Have a show playing in the background. I can be comfortable with silence sometimes, but then others not so much. Which is what happened one evening. “The Middle” was playing. It struck a chord with me that evening, so I wrote it down. And tonight I can say, unequivocably, this is the truth. I find myself, when I did the internal emotional check like I do, that I’m okay. Maybe even more than okay. And as I did this check, I heard the littles in the background, giggling over something together. Getting along. Happy with their place in life at this moment. My big girl came in and cheerfully said good night, smelling fresh and shower clean. The windows have been open all day, fresh air is filling our lungs and good things are filling our hearts. And my sick one is on the mend, with (oh please don’t let me put this out there and have it mess things up) no signs of anyone else catching the bug. Good evening, happy children=happy Mama. 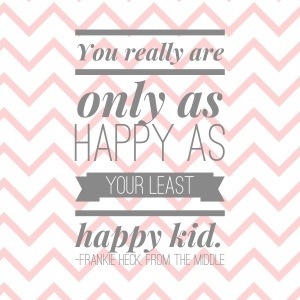 I think Frankie’s right–if any one of mine were less than happy, as has been the case on more evenings than I care to count, I wouldn’t be very happy myself. Tonight I’m thankful for the sounds of simple joy and happiness in my home. I’m thankful for shows that make the effort to share wise thoughts every now and again. And most of all, I’m thankful for the peace in our home as the night settles in, the birds quiet down and frogs tune up their instruments. Quite the symphony, and it makes me smile.